Home sales were so brisk, average market time dipped to just 34 days. Of course in San Jose, CA, houses sold in about 24 days. Silicon Valley boasts the most expensive and hottest real estate market in the country. Nationally, the number of homes for sale dropped 7%. What’s worse, March marked the 22nd straight month of falling inventory, according to NAR. The Midwest and Northeast drove home sales rising about 10% in both markets. With low inventory comes higher prices. 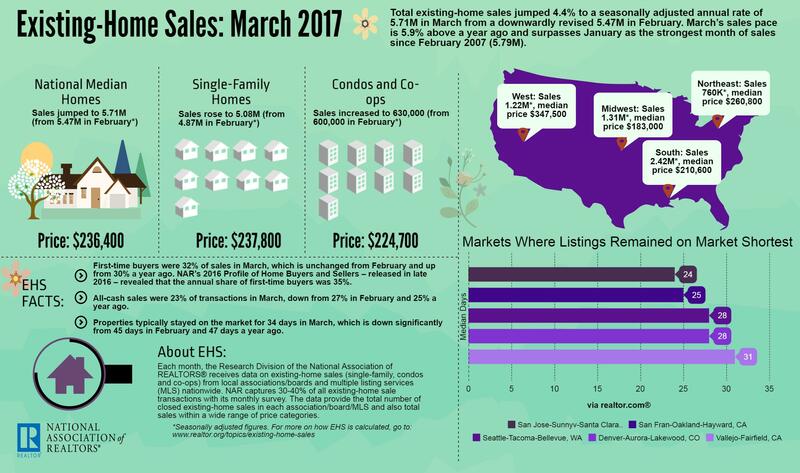 The U.S. median price of an existing home rose nearly 7% in March to $236,400. Higher prices haven’t stopped buyers, probably because rates are still relatively low even though rates have risen every month this year. Homebuyers were able to lock in 30-year fixed rate mortgages for an average of 4.2% in March, according to Freddie Mac. That’s up from 3.69% last March.